Giving you all a break from my recent blogs ranting about our industry, let’s talk about NAB. First, ask yourself, why don’t you attend this show? Is this a market niche you don’t pursue? You don’t have any broadcast projects? Is broadcast not AV? Well let me tell you, if you answered “no” to any or all of these questions, that’s why you SHOULD go to NAB. I have always been fascinated how just by labeling a project “broadcast” makes most of the AV world turn their heads away. What the heck? Broadcast is a world of high tech, complex electronics assembled together to with audio, video, and control signal components to form a working technical system operated by end-users (we call production/post production folks) for clients in various vertical markets. Hmmm…isn’t THAT AV? Let’s be clear, “broadcast” doesn’t mean the big TV networks. Most if not all your (corporate) clients have internal corporate communications, creative services, or marketing departments that have in-house “broadcast” facilities. By this, we mean: a small video production studio; video edit suites/post production; graphics workstations; and audio/voice over rooms. Once you dive into each of these “systems,” you will find that they are very similar to AV systems. Different yes, but fundamentally, it’s easily in our AV world. I don’t know why, but both AV consultants and AV systems integrators shy away from this (profitable) work (except those known as “broadcast system integrators”). It takes the same skill sets to design, engineer, procure, assemble, install, test, and commission a broadcast system as it does any complex AV system. I assure you, nobody can shop Amazon to buy an Evertz 100 GB ethernet switcher. One would hope and expect that the profit margins in broadcast are higher than those of AV projects. · 4K - Everything UHD for switchers, displays, cameras etc. · Go Pro Hero – Strap a video camera to ANYTHING. · Drones - Every size and shape. · Blackmagic Design – They build audio/video boxes for everything. · Canon – Hey, we do video, seriously. · LED lighting – Remote controlled, color corrected on 1/10th the power. · Steadicams, mounts, gimbals – No more shaky videos! · Digital editing/workflow – Avid, NewTek, Adobe Premier Pro, Final Cut Pro. · Storage hard drives – Now counting in the petabyte range. So, if you missed NAB this year, give some careful thought to attending next year. You will find a “world” very similar yet completely different from InfoComm. And if you think that doesn’t make sense, all I can say is you have to be there to understand it. Christopher Maione is a recognized leader and expert in the AV industry with over 28 years of audiovisual design and project management expertise. 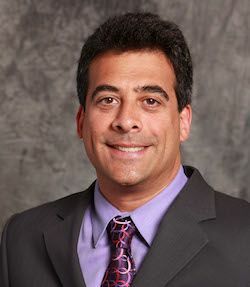 Well versed in all aspects of AV, IT, and acoustics, Maione is an Adjunct InfoComm Faculty Member and an accredited CTS RU provider and serves on a variety of key industry standard committees. For more info please contact info@chrismaione.com, www.chrismaione.com.